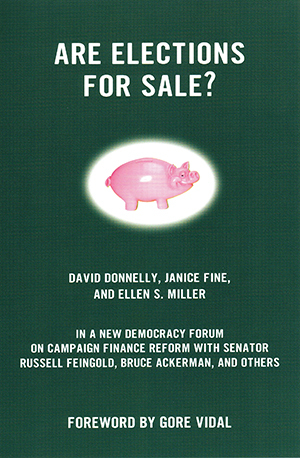 Beacon Press: Are Elections For Sale? In recent years, many voters have wondered whose voices are actually heard by our elected representatives. As the cost of running competitive political campaigns escalates and politicians appeal increasingly to wealthy interests to finance election bids, voters in many states have passed, or are primed to vote on, campaign finance initiatives. In Are Elections for Sale?, David Donnelly, Janice Fine, and Ellen S. Miller argue that only full public funding of campaigns can ensure democratic elections, and they review the successes some states have had with the Clean Elections Act.